Dubai, UAE, 11 February 2019: Randy Nader and Adam Ben Haj of GEMS Wellington Academy Silicon Oasis (GEMS WSO) snatched a close victory over last season's Junior ESKC champion, Kings Dubai, to claim the second round in the Junior division of the Emirates Schools Karting Championship (ESKC) on Sunday evening (10 February) at Dubai Kartdrome. Veteran team Dragsters DXB, with drivers Elie Nassar and Joshua McGregor, topped the Nomad Class field, putting the team level with Nas Nomad in the lead for the Nomad Cup championship. 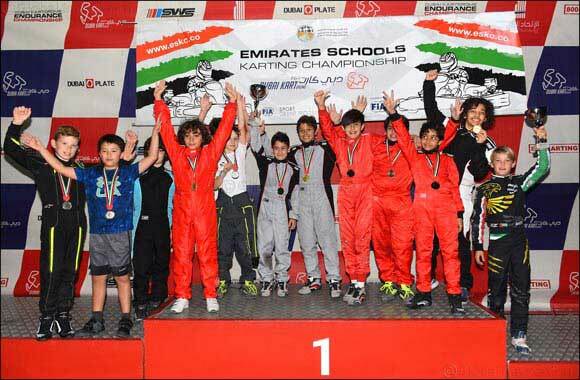 A total of 17 student teams lined up on the grid to compete in four sprint race heats in the second Junior ESKC round at Dubai Kartdrome. Adam Ben Haj got his team, GEMS WSO, off to a great start with a commanding drive in heat one, crossing the finish line 4.665 seconds ahead of Joshua McGregor of Dragsters DXB. Race two belonged to defending champion Kings Dubai, with Oscar Lambert nabbing the chequered flag just a second clear of Federico Al Rifai of Nord Anglia School Dubai. First round winner Gems International School (GIS) Team 1 finally made a statement with Nathan Pope edging out Adam Ben Haj of GEMS WSO by just 0.931 seconds to take the win. Al Rifai of Nord Anglia School Dubai made up for his runner-up position earlier to storm back and take the final race heat by 1.205 seconds ahead of Elie Nassar of Dragsters DXB. After points from all four heats were computed, Randy Nader and Adam Ben Haj of GEMS WSO received the winner's trophy, having amassed 111 points and pipping Kings Dubai by a single point. GIS Team 1 claimed third with 107 points, but the team still maintains its lead on the ESKC Class Championship. Dragsters DXB, with drivers Elie Nassar and Joshua McGregor, racked up 103 points, topping the Nomad category and it is now neck-and-neck with rival Nas Nomad team to lead the Nomad Cup Championship standings. The next Junior ESKC round will take place on Sunday, 24 February 2019 at Dubai Kartdrome.